Are you looking for a complete course in Norwegian which takes you effortlessly from beginner to confident speaker? 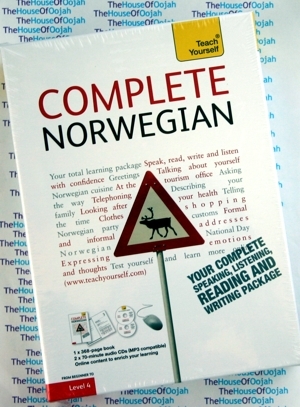 Whether you are starting from scratch, or are just out of practice, Complete Norwegian will guarantee success! Now fully updated to make your language learning experience fun and interactive. You can still rely on the benefits of a top language teacher and our years of teaching experience, but now with added learning features within the course and online. The course is structured in thematic units and the emphasis is placed on communication, so that you effortlessly progress from introducing yourself and dealing with everyday situations, to using the phone and talking about work. By the end of this course, you will be at Level B2 of the Common European Framework for Languages: Can interact with a degree of fluency and spontaneity that makes regular interaction with native speakers quite possible without strain for either party. Extra online articles at: www.teachyourself.com to give you a richer understanding of the culture and history of Norway. 01 Hello! What is your name? 11 Happy Christmas! Happy New Year! Margaretha Danbolt Simons is Norwegian, but has lived in England for many years. She has been teaching at the University of Surrey for the last ten years. Her course, Norwegian ab initio, which is part of the MA/Diploma in Translation Studies, attracts 15-20 students per year. She uses her own book 'Teach yourself Norwegian' as her textbook and main teaching aid. Other subjects she teaches at the University of Surrey are Medical and Literary translation, English into Norwegian, and an introductory course of Interpreting. She runs two Norwegian classes at the Guildford Adult Education Centre, one for beginners and one intermediate, and also teaches on a one-to-one basis. Students include diplomats and businesspeople.